To ask other readers questions about 21 Lessons for the 21st Century, please sign up. How people rated the book without reading it? Is it needed and/or recommended to read Sapiens and Homo Deus from the same author before this book ? The human mind wants to worry. This is not necessarily a bad thing—after all, if a bear is stalking you, worrying about it may well save your life. Although most of us don’t need to lose too much sleep over bears these days, modern life does present plenty of other reasons for concern: terrorism, climate change, the rise of A.I., encroachments on our privacy, even the apparent decline of international cooperation. 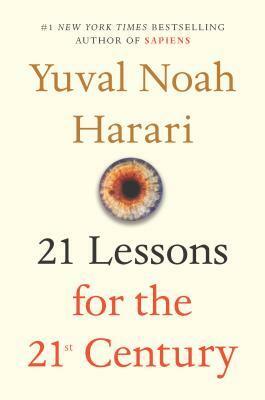 In his fascinating new book 21 Lessons for the 21st Century, the historian Yuval No The human mind wants to worry. This is not necessarily a bad thing—after all, if a bear is stalking you, worrying about it may well save your life. Although most of us don’t need to lose too much sleep over bears these days, modern life does present plenty of other reasons for concern: terrorism, climate change, the rise of A.I., encroachments on our privacy, even the apparent decline of international cooperation. These are admittedly big questions, and this is a sweeping book. There are chapters on work, war, nationalism, religion, immigration, education, and 15 other weighty matters. But its title is a misnomer. Although you will find a few concrete lessons scattered throughout, Harari mostly resists handy prescriptions. He’s more interested in defining the terms of the discussion and giving you historical and philosophical perspective. The point is that today’s competition among nations—whether on an athletic field or the trading floor—“actually represents an astonishing global agreement.” And that global agreement makes it easier to cooperate as well as compete. Keep this in mind the next time you start to doubt whether we can solve a global problem like climate change. Our global cooperation may have taken a couple of steps back in the past two years, but before that we took a thousand steps forward. Here’s another worry that Harari deals with: In an increasingly complex world, how can any of us have enough information to make educated decisions? It’s tempting to turn to experts, but how do you know they’re not just following the herd? “The problem of groupthink and individual ignorance besets not just ordinary voters and customers,” he writes, “but also presidents and CEOs.” That rang true to me from my experience at both Microsoft and the Gates Foundation. I have to be careful not to fool myself into thinking things are better—or worse—than they actually are. What does Harari think we should do about all this? He offers some practical advice, including a three-prong strategy for fighting terrorism and a few tips for dealing with fake news. But his big idea boils down to this: Meditate. Of course he isn’t suggesting that the world’s problems will vanish if enough of us start sitting in the lotus position and chanting om. But he does insist that life in the 21st century demands mindfulness—getting to know ourselves better and seeing how we contribute to suffering in our own lives. This is easy to mock, but as someone who’s taking a course on mindfulness and meditation, I found it compelling. As much as I admire Harari and enjoyed 21 Lessons, I didn’t agree with everything in the book. I was glad to see the chapter on inequality, but I’m skeptical about his prediction that in the 21st century “data will eclipse both land and machinery as the most important asset” separating rich people from everyone else. Land will always be hugely important, especially as the global population nears 10 billion. Meanwhile, data on key human endeavors—how to grow food or produce energy, for example—will become even more widely available. Simply having information won’t offer a competitive edge; knowing what to do with it will. Similarly, I wanted to see more nuance in Harari’s discussion of data and privacy. He rightly notes that more information is being gathered on individuals than ever before. But he doesn’t distinguish among the types of data being collected—the kind of shoes you like to buy versus which diseases you’re genetically predisposed to—or who is gathering it, or how they’re using it. Your shopping history and your medical history aren’t collected by the same people, protected by the same safeguards, or used for the same purposes. Recognizing this distinction would have made his discussion more enlightening. I was also dissatisfied with the chapter on community. Harari argues that social media including Facebook have contributed to political polarization by allowing users to cocoon themselves, interacting only with those who share their views. It’s a fair point, but he undersells the benefits of connecting family and friends around the world. He also creates a straw man by asking whether Facebook alone can solve the problem of polarization. On its own, of course it can’t—but that’s not surprising, considering how deep the problem cuts. Governments, civil society, and the private sector all have a role to play, and I wish Harari had said more about them. Terri "If science is eventually able to give that dream to most people, and large numbers of people no longer need to work in order to feed and clothe every "If science is eventually able to give that dream to most people, and large numbers of people no longer need to work in order to feed and clothe everyone, what reason will we have to get up in the morning?" I am somewhat surprised by this odd rhetorical question of "what reason will we have to get up in the morning" as one thinks that surely the answer should be clear and straight forward considering all the immeasurable combinations and permutations of events -large and small - that had to occur over a period 14 billion years to establish the awe-inspiring physical existence and experience of human consciousness.
" The mind is its own place, and in itself. Yuval Harari is well known for his books Sapiens and Homo Deus. He has decided to squander his reputation on a book called 21 Lessons for the 21st Century. The basic problem is that every chapter is the subject of whole shelves of books, and putting them all in one book cannot possibly do them justice. What we have left is a set of 21 editorials, which might inform the totally uninformed, but provide little insight and no solutions. As “lessons” they are unhelpful. He has conveniently distilled all the threats to mankind into three: nuclear war, climate change and technological/biological disruption. But only technological/biological gets examined. You’re on your own for climate change and nuclear war, which apparently don’t rate high enough for “lessons”. Despite those three most important threats, the most common theme throughout the book is criticism of religion, mostly Judaism, Christianity, and Islam, though Buddhism and Hinduism come under attack as well. Looking back from the perspective of the universe, Harari condemns all religions as pompous, pretentious, full of contradictions, and terrifically negative forces. -If immigrants assimilate, they become “us” rather than “them” and must be treated as first class citizens. Simple, inaccurate and totally missing the real issues. In the chapter on war, he comes to the magical conclusion that we’ve pretty much done away with it. So far, the only new war we’ve seen this century is Russia taking parts of Ukraine. He says countries see too much risk in starting new wars. He completely ignores (not for the first or last time), the effects of climate change, which will result in unprecedented and massive wars as countries face unstoppable waves of immigrants seeking water and land, as countries disappear from the face of the earth, and as those that have will defend it to the death against all comers, foreign and domestic. The final chapter is on meditation. Meditation is Harari’s solution to pretty much everything, because you can focus on what is real – what is going on in your body right then and there. He says he does this two hours a day, plus one or two months a year. If I had to summarize 21 Lesson for the 21st Century, I would say: throw off the false faiths of institutional religions and meditate instead. Not quite what I expected, and not much help in navigating the 21st century. This book is quite difficult to review. I enjoyed Part 1 about the technological challenges humans will be faced with and how we can adapt. It reminded me that I need to read Homo Deus which hopefully will satisfy that craving for me. The rest of the book was more political, religious and philosophical than I usually go for. The title misrepresented the content of the book as there are 21 chapters, not 21 lessons. Overall learned quite a bit but I much preferred his other work. I received an ARC fr This book is quite difficult to review. It's Life as we know it, Jim! (But don't ask what it means). “We are now living in an age of information explosion … the last thing people need is more information. What they really need is somebody to arrange all of the bits of information into a meani It's Life as we know it, Jim! (But don't ask what it means). 'Globalisation has certainly benefited large segments of humanity, but there are signs of growing inequality both between and within societies. Some groups increasingly monopolise the fruits of globalisation, while billions are left behind. Already today, the richest 1 per cent owns half the world’s wealth. Even more alarmingly, the richest hundred people together own more than the poorest 4 billion. This could get far worse'. “… it is equally important to communicate the latest scientific theories to the general public through popular-science books, and even through the skilful use of art and fiction. Does that mean scientists should start writing science fiction? That is actually not such a bad idea. Art plays a key role in shaping people’s view of the world, and in the twenty-first century science fiction is arguably the most important genre of all, for it shapes how most people understand things like AI, bioengineering and climate change. We certainly need good science, but from a political perspective, a good science-fiction movie is worth far more than an article in Science or Nature.”. This is the book I will pass on to my grand daughter when she is of an age to wonder why our world is the way it is. In fact, I think it is essential reading for every human being on this planet. "I am free to create my own dharma." This book has been an interesting, fascinating, enlightening, liberating, scary and an exciting read! 21 Lessons for the 21st Century by Yuval Noah Harari is all about perspective on what's happening right now and clarity about the greatest challenges and important choices. This book covers a wide range of topics, from Disillusionment, War, Politics to Meditation. Homo sapiens is just not built for sati "Change is the only constant." Homo sapiens is just not built for satisfaction. Human happiness depends less on objective conditions and more on our own expectations. These lessons don't exactly provide answers for the challenges, but are more focused on helping us think, research further and be prepared for the "change". The truth is that truth was never high on the agenda of Homo sapiens. But in truth, everything you will ever experience in life is within your own body and your own mind. Even though, overall, the book focuses on the important social, economic and political challenges, the content is much deeper and stimulating. "It is our own human fingers that wrote the Bible, the Quran, the Vedas, and it is our minds that give these stories power." Harari sendo Harari. Mais um daqueles livros que mudou a minha perspectiva em uma série de fatores. Da sociedade japonesa ao movimento político atual. O livro pula bastante da discussão sobre super-humanos tocando o mundo do futuro, o que achei ótimo, já que é algo que ele discute bastante em Homo Deus. Em 2016, li o Networks of Outrage and Hope: Social Movements in the Internet Age, do Castells, que fala sobre como vários países estão passando por um movimento de descrédito da política, um misto Harari sendo Harari. Mais um daqueles livros que mudou a minha perspectiva em uma série de fatores. Da sociedade japonesa ao movimento político atual. O livro pula bastante da discussão sobre super-humanos tocando o mundo do futuro, o que achei ótimo, já que é algo que ele discute bastante em Homo Deus. Em 2016, li o Networks of Outrage and Hope: Social Movements in the Internet Age, do Castells, que fala sobre como vários países estão passando por um movimento de descrédito da política, um misto de decepção com os políticos e desapontamento quando percebemos que as promessas não serão cumpridas. Harari dá um contexto e uma perspectiva para isso, quando discute como estamos chegando em um ponto onde não há uma grande mensagem política que unifique as pessoas e a ansiedade que vem dessa falta de missão. I've read all of Harari's books and I really like him as a thinker and a writer. This book is wonderful in the way all his books are wonderful and is flawed in the way the rest are. It is an act of bold ambition and also hubris to write a history of the world, answer the meaning of life, and to propose a path toward the 22nd Century. He certainly does not do all of that, but the act of trying is a lot of fun to read. A lot of his predictions for the future sound like fantasy and science fiction, I've read all of Harari's books and I really like him as a thinker and a writer. This book is wonderful in the way all his books are wonderful and is flawed in the way the rest are. It is an act of bold ambition and also hubris to write a history of the world, answer the meaning of life, and to propose a path toward the 22nd Century. He certainly does not do all of that, but the act of trying is a lot of fun to read. A lot of his predictions for the future sound like fantasy and science fiction, but as he readily admits, anyone who tries to imagine the future without sounding like a sci fi writer is certainly wrong. That's fine, but some of the predictions did seem to me to be pretty far fetched. As always, masterful and exquisite non-fiction writing as we come to expect from Mr Harari. Delightful, wise and very perceptive. This book can be seen as an expansion and a companion to Homo Deus: A Brief History of Tomorrow. The attention of this volume is focused on the Present as opposed to Past or the Future. Some parts will make you feel inspired, others will sow a despair. But it is a relevant and useful book that will give you a plenty to chew on. Harari is one of my favorite authors of late, and his books Sapiens and Home Deus are among my favorites. This book builds on those, and is equally fascinating. He is one of those clear thinkers who is able to put together multiple macro trends combined with philosophical perspective. Sapiens is about the past, Deus about the future, and this book purports to be 21 lessons about the present. But it is also rooted in the past, and preparing us for the future. One of Harari's key themes in Deus an Harari is one of my favorite authors of late, and his books Sapiens and Home Deus are among my favorites. This book builds on those, and is equally fascinating. He is one of those clear thinkers who is able to put together multiple macro trends combined with philosophical perspective. Sapiens is about the past, Deus about the future, and this book purports to be 21 lessons about the present. But it is also rooted in the past, and preparing us for the future. "for every dollar and every minute we invest in improving artificial intelligence, it would be wise to invest a dollar and a minute in advancing human consciousness." He goes on to further explain that our whole economic system is causing us to head in this direction, and to - except for a small number of people who opt to prioritize differently - largely ignore how to improve ourselves. "The economic system pressures me to expand and diversify my investment portfolio, but it gives me zero incentive to expand and diversify my compassion. So I strive to understand the mysteries of the stock exchange while making far less effort to understand the deep causes of suffering." Another consequence of AI that is fascinating is that it can enable intelligence at a scale we today can't comprehend, which can be dangerous if it is controlled by the wrong people. AI is just a function of the data you put into it, so it follows that who holds the data in the future, will hold the power. I think this is a key concept. "In the twenty-first century, however, data will eclipse both land and machinery as the most important asset, and politics will be a struggle to control the flow of data." Harari talks about trends in globalization, nationalism, immigration, religion, terrorism, and war. A common theme across these is that many people worry a lot that trends in these areas is a cause for concern and causing decline in our world. However the truth is that in most of them, we have come a long way and made a lot of progress - however because we live in an unprecedented age of information sharing - "media" - people are a lot more aware of even small issues in these areas. Also, our governments are predicated on keeping us safe from political violence, so even small issues like terrorism (small in the sense of how many people die from it each year) can have outsized importance to people. He talks about the danger of propoganda/fake news and fascism and how in todays technological climate there is more risk of them so its better if everyone understands them. He explained this really well in his TED talk - highly worth watching. But in the end, the only major recommendation Harari makes is around meditation. He impressively meditates for TWO HOURS per day, and TWO MONTHS per year. That is obviously a *huge* time commitment, and yet one he finds fulfilling. If we are going to invest in ourselves, the biggest way might be to start with our minds, and to stop worrying about all of these trends - because in the end, they don't matter to our ability to have a good, happy, loving life. As lições que se apresentam neste livro, advém de conversas que o professor Youval Noah Harari teve com várias pessoas: alunos, leitores, investigadores, políticos, etc. A lente que aqui se apresenta não é a de um microscópio, mas sim a lente dos óculos do professor. Este espírito não o tive na minha primeira abordagem ao livro, e talvez por isso o tenha afastado inicialmente por discordar do discurso de Harari . Ora, é precisamente nesta primeira parte que discordei em algumas das opiniões, que, diga-se: Harari já as tinha dissecado no livro Homo Deus, e que foi alvo de crítica por parte de cientista da área da computação e da área da biologia, embora tenha mudado um pouco o discurso, continua a bater na tecla do filme de ficção cientifica, os robots são “Os vilões”, e a humanidade a vitima. Nesta primeira parte, o foco é a biotecnologia e as tecnologias de informação, mas tanto a primeira como a segunda estão em processo de gestação, vemos algumas transformações, poucas, mas nada nos indica, e Harari também não conseguiu explicar: Como é que os Robots irão mandar no mundo, ou como é que os algoritmos irão controlar a mente humana. Profecias há por aí muitas, mas explicar cabalmente de forma lógica ainda ninguém o fez. Pedro Domingues, especialista em aprendizagem automática, explica no livro “ A Revolução do Algoritmo Mestre - Como a Aprendizagem Automática Está a Mudar o Mundo”, que estamos no encalce do algoritmo que conseguirá, conscientemente, se “re-auto-ensinar” (palavra minha, apenas para explicar o objetivo final do algoritmo mestre), mas ainda temos um longo caminho a percorrer até ao veredito final. Ora, se os especialistas ainda não encontraram a solução e poderão demorar dezenas, milhares ou nunca conseguir tal proeza, saberá alguém afirmar com garantias que os algoritmos irão dizimar o homo sapiens? Chega de divulgar aquilo que é o discurso do medo. A verdade é que ninguém sabe o dia de amanhã. No passado, não muito distante, milhões de pessoas trabalham na agricultura e morria-se à fome, hoje são poucos que trabalham a agricultura e ninguém morre de fome (refiro-me essencialmente ao Ocidente). É claro que centenas de profissões irão desparecer, mas isto não é nada novo, sempre foi assim. Há 20 anos quantos informáticos existiam? E hoje? Morreram os agricultores nasceram os informáticos que lhes sucederam e é assim ao longo de milénios, e assim irá continuar. Concordo em absoluto, Harari detém uma grande capacidade de análise, para além de um vasto conhecimento dos problemas que afectam o globo terrestre, os princípios nacionalistas, os regimes comunistas, o pavor que o ser humano ainda enfrenta sobre o desconhecido, apesar das inúmeras descobertas científicas que tentam explicar alguns fenómenos. É curioso que sendo judeu não se deixou levar pelo fervor judaísta, fala sobre as religiões com grande pragmatismo expondo o que cada uma delas tem de bom e o que tem de mau. Como o atentado de 11 de setembro de 2001 abalou o mundo, que impôs um medo exacerbado nas cabeças dos humanos, o medo do terrorismo, que na prática mata muito menos que os problemas de saúde no aparelho respiratório que a industrialização provoca. Há um aproveitamento político mundial, sobre o medo que os cidadãos sentem do terrorismo, que os instiga ao ódio e à raiva, legitimando as invasões que os aliados lançam sobre os países ricos em recursos naturais. Esta parte é igualmente interessante, como podem ver pelos títulos das lições. As dicotomias: verdade/mentira, justiça/injustiça, real/fictício, responde-se apenas com o primeiro título Ignorância: sabemos menos do que julgamos. A verdade anda de mãos dadas com a mentira, há que ser prudente ao abraçar doutrinas. Concordo com as palavras de Youval, contudo, acrescentaria mais uma lição, emocional/racional. creio que temos tendência a julgar o mundo, ora pelo lado emocional, ora pelo lado racional, mas há alturas que nenhuma nos serve. Lição 21 - Meditação: Observar, simplesmente. A educação, fala-se tanto sobre ela, umas vezes bem (poucas) outras vezes mal, mas o que é certo é que todos falam sobre ela, todos têm grandes ideias, todos sabem exactamente o que deve ser feito, todos têm opiniões, conselhos e orientações para dar. Unlike the author's previous books, this one was clearly "written" at the request of publishers; a pure marketing move. This should have been obvious, if not from the painfully commercial title, then from the fact that the author would not have had the time to write anything of substance since Homo Deus. The book is a collection of essays, and it would have been more honest to market it as such. The essays themselves vary in quality; some are fairly interesting and/or enjoyable, others so full of Unlike the author's previous books, this one was clearly "written" at the request of publishers; a pure marketing move. The book is a collection of essays, and it would have been more honest to market it as such. The essays themselves vary in quality; some are fairly interesting and/or enjoyable, others so full of banalities that they would pass as generic blog posts on "the meaning of life" or "the fate of humanity". The most annoying thing was the attempt at faking cohesion by superficially connecting each chapter to the one after it. At times, this was done in such an obvious and contrived way using a single paragraph. My disaffection with the book's misleading marketing was only made worse when the book ended with the author's anecdotal experience with meditation. Specially since that mini chapter counted as one of the "21 Lessons for the 21st century". What can I say about this book that will do it justice? Nothing. 21 Lessons for the 21st Century is yet another seminal work by Yuval Noah Harari, which deals with the challenges facing us here and now. He tackles different topics from varying perspectives. Even if you do not agree with everything he says, one thing is for sure - he makes you think. Prepare to have your worldview expand if you read this book. It is a definite keeper. Or: Don't ask what it means! Globalisation has certainly benefited large segments of humanity, but there are signs of growing inequality both between and within societies. Some groups increasingly monopolise the fruits of globalisation, while billions are left behind. Already today, the richest 1 per cent owns half the world’s wealth. Even more alarmingly, the richest hundred people together own more than the poorest 4 billion.This could get far worse. The author has a good sense of the forces that are shaping our world. The author really understands the current historical moment and the factors that people should pay attention to. From education to war and peace, to class warfare, to technological displacement, to climate change the author gives a good guide to the times we are living in. Good stuff. Adoro Harari. Adorei os dois primeiros livros — "Sapiens" (2011) e "Homo Deus" (2015). "21 Lessons for the 21st Century" (2018) é um livro diferente dos anteriores, nota-se que foi escrito de forma muito mais rápida, menos amadurecida, mais como resposta ou encomenda, o que ele próprio confirma quando diz que queria responder às perguntas que lhe foram fazendo nos últimos dois anos enquanto foi apresentando os anteriores livros pelo mundo fora. Na verdade este livro nada oferece de novo, lê-se c Adoro Harari. Adorei os dois primeiros livros — "Sapiens" (2011) e "Homo Deus" (2015). "21 Lessons for the 21st Century" (2018) é um livro diferente dos anteriores, nota-se que foi escrito de forma muito mais rápida, menos amadurecida, mais como resposta ou encomenda, o que ele próprio confirma quando diz que queria responder às perguntas que lhe foram fazendo nos últimos dois anos enquanto foi apresentando os anteriores livros pelo mundo fora. Na verdade este livro nada oferece de novo, lê-se como uma repetição dos argumentos já anteriormente esgrimidos, aos quais se adicionaram uns pózinhos de atualidade, e ainda uma ligeira variação do discurso, tornando o tom menos especulativo num mais assertivo. Pois é, mesmo para alguém tão brilhante como Harari, dar respostas novas ou diferentes é difícil. Aliás, é um pouco como ele diz no início do livro, os filósofos andam há milhares de anos a tentar responder ao sentido da vida e até agora nada. Pois, o mesmo para Harari, ainda que tenha tentado responder baseado nos ditos dos Monti Python, era difícil ir além fosse por que via fosse, o que não tem mal algum, o que conta é a discussão. Neste sentido, recomendo vivamente a leitura a quem ainda não leu os anteriores dois livros, os restantes podem passar. Kitabın neredeyse her paragrafı, okurken (bir türlü) mantıklı geliyor, ama kitabın kapağını kapatıp üzerine biraz düşündüğünüzde bir şeyler kopuk, ya da eksik duygusuna kapılıyorsunuz. (En azından ben bu duyguya kapılıyorum) Sanırım Harari'nin de kafası epeyce karışık. Kitabın Adalet bölümü en orijinal fikirlerin olduğu bölüm. Adalet duygumuzun neden bulanık olduğuna Harari'nin getirdiği açıklamalar oldukça ilginç. Bilim Kurgu bölümü bence kitabın en sığ ve yanlış yorumlanmış bölümü. Sanırım Harar Kitabın neredeyse her paragrafı, okurken (bir türlü) mantıklı geliyor, ama kitabın kapağını kapatıp üzerine biraz düşündüğünüzde bir şeyler kopuk, ya da eksik duygusuna kapılıyorsunuz. (En azından ben bu duyguya kapılıyorum) Sanırım Harari'nin de kafası epeyce karışık. Bilim Kurgu bölümü bence kitabın en sığ ve yanlış yorumlanmış bölümü. Sanırım Harari bilim kurguyu çok hafife alıyor, ya da bilim kurgunun belli bir alt-türüne aşırı vurgu yaparak türü sıradanlaştırıyor. Bilim kurgu edebiyatına çok hakim olmadığını düşünüyorum. Harari'nin genel yaklaşımında bir başka sorun, olay ve olguları tarihsel bağlamından kopartarak yorumlaması. Mesela koskoca SSCB tarihini, Stalin dönemine indirgeyip (ki bir savaş ve işgal ile yok olma tehlikesi beliren bir zamandır) bu kadar katı eleştirmesinin, Sovyetlerin büyük başarılarına ve (öyle veya böyle) eşitlikçi bir toplum kurma gayretlerine haksızlık olduğunu düşünüyorum. I got a lot out of this book. I do understand the criticisms that Harari can be unfocused in this list of lessons, or rather questions without clear answers (but what's wrong with that? ), and it is not quite the must-read that was Sapiens and even Homo Deus. That said, having a book of Yuval Harari disjointedly riffing about the state of the world is about the most fascinating kind of read I could ask for. The more, the better. His ideas about religion, technology, story-telling, identity, medit I got a lot out of this book. I do understand the criticisms that Harari can be unfocused in this list of lessons, or rather questions without clear answers (but what's wrong with that? ), and it is not quite the must-read that was Sapiens and even Homo Deus. If only there was a way to make everyone in the world read Harari and have some real perspective about all that is going on. Seriously, those with power may be just the kinds to not to seek truth--as is expertly explained within--but it sure would be nice if they did read more. political movements are discussed, and one does come away more convinced than ever that such movements are extremely not equipped to deal with the problems that are coming? це книжка, яку не можна прочитати "запоєм", бо вона містить стільки ідей та прогнозів і провокує стільки думок, що потрібен час на їх осмислення. І водночас це книжка, від якої дуже складно відірватися, тому що йдеться у ній про речі, які потенційно стосуватимуться усіх нас (або наших дітей чи внуків). От, наприклад Великі Дані (Big Data), їхні алгоритми і штучний інтелект. Здавалося б, який стосунок вони мають до рядового офісного працівника в Токіо, лікаря-терапевта в Чикаго чи до лакшері-діви це книжка, яку не можна прочитати "запоєм", бо вона містить стільки ідей та прогнозів і провокує стільки думок, що потрібен час на їх осмислення. І водночас це книжка, від якої дуже складно відірватися, тому що йдеться у ній про речі, які потенційно стосуватимуться усіх нас (або наших дітей чи внуків). От, наприклад Великі Дані (Big Data), їхні алгоритми і штучний інтелект. Здавалося б, який стосунок вони мають до рядового офісного працівника в Токіо, лікаря-терапевта в Чикаго чи до лакшері-діви в Києві? Насправді, безпосередній. Адже весь той масив інформації про нас (від того, які сайти ми найчастіше і найдовше переглядаємо, до біометричної інфи типу як реагує наш пульс на ті чи інші картинки) вкупі зі спеціальними алгоритмами, прогнозує Харарі, може вирішувати за нас купу всього - що нам купувати, які фільми дивитися, курити чи вести здоровий спосіб життя тощо. І якщо деякі речі відбуватимуться непомітно (Гугл підсовуватиме лише _потрібні_ і _найкращі для нас_, на думку алгоритмів, видачі (це як контекстна реклама, тільки зі ще індивідуальнішим підходом), то деякі суттєво обмежуватимуть наш свідомий вибір (страхова і/або роботодавець, за результатами детальних біометричних даних, вимагатиме кинути курити). Завдяки видавництву BookChef я стала однією з 30 осіб в Україні, які першими змогли прочитати цю книжку українською (бо офіційно в продаж вона надійде лише 10 вересня), і за це я справді вдячна!